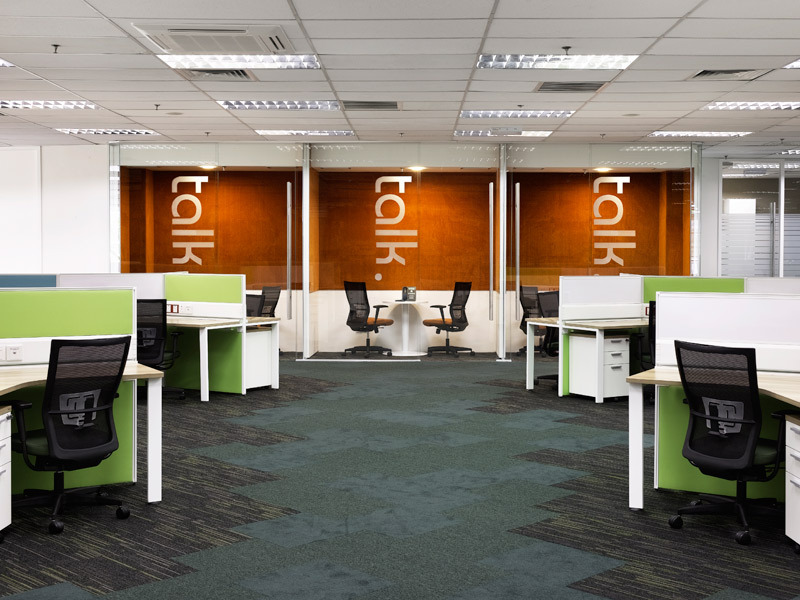 When Fuji Xerox – a leading company in Document Services & Communications – required design and build services to expand their Asia Pacific Client Support Centre based in Kuala Lumpur, they chose SL&A Sendiran Berhad (KL) as their project partner. This allowed for a continuation of a long standing business relationship which began in 2008 with the design and build of their first client support centre. Since then Fuji Xerox has developed into one of our most valued clients, giving us opportunities to work with them in 2010, and again in 2013. The evolution of client service requires call centres to keep pace with the new demands being placed on them. The call centre is no longer just another department, it’s the front door to the company — often the only opportunity companies have to build relationships with their customers. For Fuji Xerox’s new centre, there was a need to develop a design beyond the traditional “ducks in a row” configuration to a more progressive solution, satisfying all constituencies – employees, clients, and management. The brief demanded a flexible space with emphasis on establishing a collaborative environment for work cells based on language and geographic sectors. The look and feel required showcasing Fuji Xerox’s service, support, and sales acumen, combining into a space to attract new talent and support employee retention. 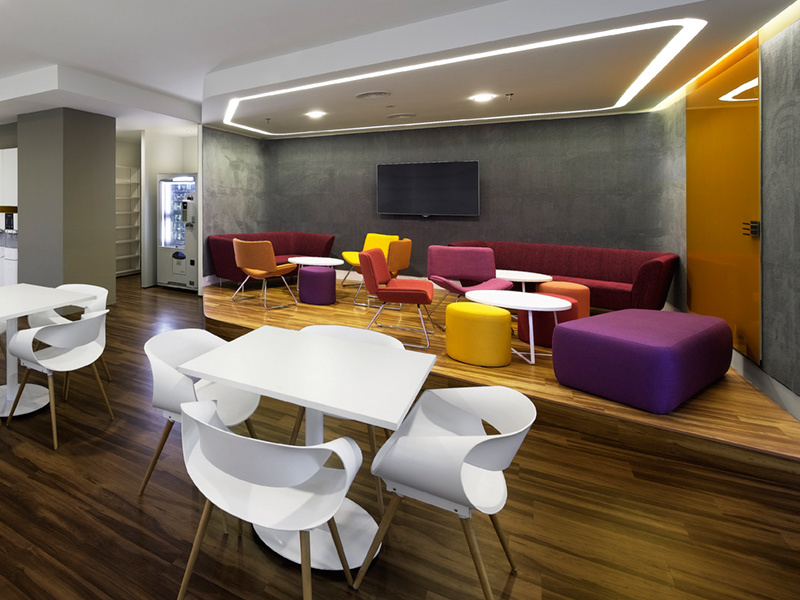 The result – Fuji Xerox’s expanded Support Centre which will accommodate employees working in various shifts. The space, developed into a dynamic non-rectilinear plan, utilises the 120 degree workstation giving each staff member their own unique view. In avoiding employees directly facing each other, an atmosphere of openness, diversity, and energy is created. 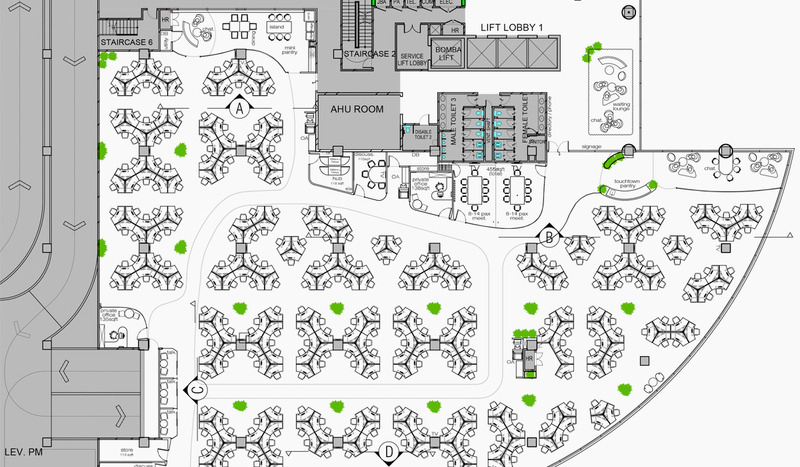 In alignment with density and safety requirements, circulation is straightforward, but provides vistas across the workplace so that navigation and interaction is encouraged. By design three types of breakout areas provide multifunctional usage for collaboration, refreshment, and casual assembly. They are allocated at the corners of the office to minimise distraction from the open offices. The main pantry, designed for ‘canteen purposes’ is segregated from the open office to contain sound allowing for moments of respite, energy, and community. Whilst the mini pantry, functioning as a secondary collaboration area, is predominantly open with a slight separation from the workplace. A smaller touchdown pantry is located adjacent to the main entrance, connected to a large collaboration area with an array of seating, providing a casual area for refreshment, employee interactions, and an opportunity for team activities. A key design element is a beautiful curved glazed facade which allows plentiful natural light into the space, offering unobstructed views of surrounding greenery. To further emphasize the curved feature, enclosed rooms were modified to reflect the architectural shape creating a smooth flow through the space. To maintain transparency, all enclosed rooms are built against the building’s core wall. With Fuji Xerox renowned worldwide for brining colour to the world of printing, doses of bold vibrancy are injected into the design with each area demarcated with hues of warm colours. Live plants are also provisioned for reflecting the company’s environmentally friendly approach, enhancing the feeling of freshness and nature in the space. 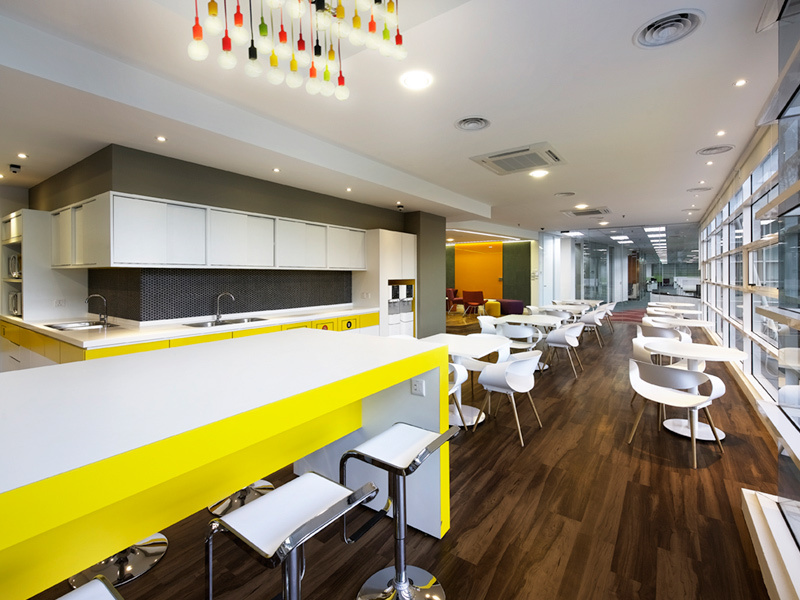 As a call centre, special attention was required to provide an acoustically sound workplace. Custom-designed floating fabric panels as glass room dividers between loud areas (such as pantry, collaboration areas and the main entrance walk way) allow the workstation area to remain a haven of focus. Despite being full height, the outcome is a light design which maintains the spaciousness. For both the client and our design team, the project outcome was a notable partnership providing staff with a workplace encouraging professional collaboration in which the entire Fuji Xerox group works as a team!